A car’s battery is one of its most vulnerable components, and you need to replace it every few years. But before replacing your car’s battery, you need to test it and see whether it still works or not. Since the electronic systems of vehicles aren’t equipped to diagnose the batteries, you should buy the best car battery testers for yourself. Every car owner needs a good car battery tester so he can regularly check the status of his car’s battery. In doing this, you would know the right time to replace your battery before it dies out completely and you’re stuck in the middle of the road. These devices are very affordable. You can see it as a minor investment and add it to your vehicle’s repair kit. So, what should you look out for in a car battery tester? Let’s find out. Since there are different types of vehicles, this means that there is also a wide range of batteries available. Some examples are wet cell batteries, lithium-ion batteries, deep cycle batteries, and more. The best car battery tester has good compatibility with different types of batteries allowing you to use it on your car and on other devices. But before making a purchase, make sure that the item you’re interested in will be able to perform a test on your car’s battery. That way, you can use it on a regular basis to check the health of your battery and find out if it’s time to find a replacement. Car battery testers are relatively simple devices, especially if you opt for the more traditional models. Ease of use is another important feature to look out for, especially if you’re not tech savvy. Also, look for a tester which you can use right out of the box without having to perform a complex setup procedure. If you plan to bring the tester along with you wherever you go, then choose one which has a compact, ergonomic design. This would make the device more portable so you can store it in your repair kit easily. Some testers can even fit into your pocket which is more convenient. Check the size of the device and see if it meets your needs. As aforementioned, there are different types of batteries available. Therefore, the compatibility of the tester is an important factor. After checking if you can use the tester for your vehicle’s battery, check what types of batteries it’s also compatible with. The higher the compatibility, the more versatile it will be. Although some people don’t even look at the tester’s brand, this can be a relevant feature too. A device that comes from a reputable brand would most likely be of high-quality. When the tester is of high-quality or premium materials, this means that it will be more durable and it will last for a longer time compared to models made from cheaper materials. Generally, car battery testers aren’t expensive. Still, you may have already set a budget for this device so you should stick to it. Car battery testers come in a wide range of prices so you need to find out which one you can afford but still comes with all the features you’re looking for. Why we like it: This is one of the best car battery testers on the market because of all its cool features. For one, it has a display which is color-coded making it easier to read. Also, it comes with indicators to show the status of your battery. 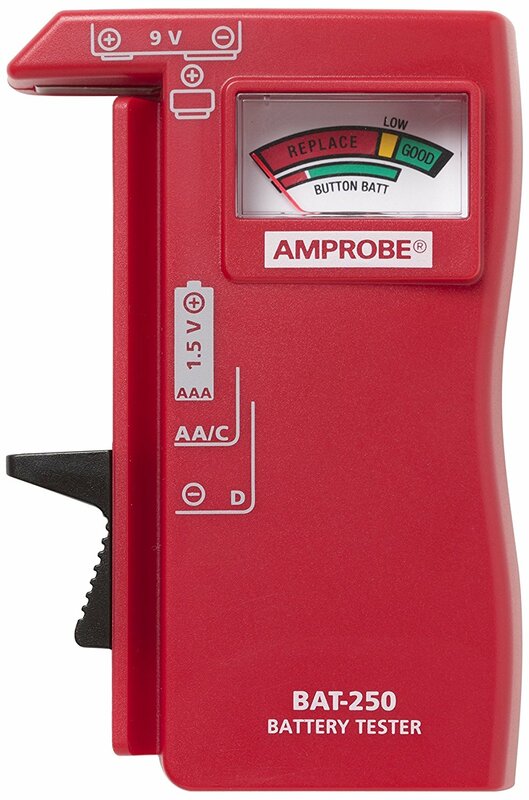 You can use the Amprobe BAT-200 Battery Tester to test different types of rechargeable and standard batteries. When it comes to instrument or sensor failure, one of the more common causes is battery failure. That’s why it’s important to have an efficient tool on-hand such as the Amprobe BAT-200 Battery Tester to test your battery before you use your car, especially when you’re planning a long drive. This battery tester shows how much charge remains in rechargeable and standard batteries. It has an analog display with a needle that moves on a calibrated and color-coded scale so you can identify the status of your battery right away. Also, this tester doesn’t need batteries to function which means that you won’t have to worry about replacement. Aside from being a car battery tester, you can also use the Amprobe BAT-200 Battery Tester for different devices like digital cameras or even remote controls. Before purchasing, make sure that the tester has compatibility with all the batteries you plan to test. Since you can use this for both high-load and low-load situations, this tester is an excellent device. This tester has a vintage design with its analog display that’s color-coded. But don’t let the appearance fool you as the Amprobe BAT-200 Battery Tester is both efficient and easy to use. It’s a highly-functional model which you can use for different vehicles from motorcycles to cars, and more. Another excellent feature of this tester is that you can switch it between different voltage types if you need to test various batteries. It has a color-coded display that’s easy to read and comes with convenient indicators. You can use it to test rechargeable and standard types of batteries. The car battery tester has a compact design making it highly portable. It doesn’t need any batteries to work. The performance isn’t consistent when used with different types of batteries. Why we like it: This is another superior car battery tester that comes from the Amprobe brand. It has a bright color making it easy to spot even when it’s stored with other devices. It’s easy to check the status of your battery using the Amprobe BAT-250 Battery Tester because of the display which has color-coded indicators. This model comes with an improved design allowing you to perform battery testing using just one hand. 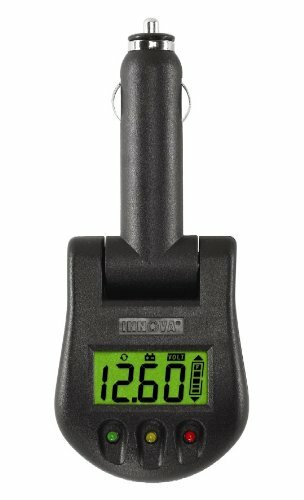 The Amprobe BAT-250 Battery Tester has a display that’s calibrated for easier and quicker reading while you’re testing. It also has a side cradle with a new design to hold the batteries in place securely while you test them. One of the best features of this car battery tester is its ergonomic design. The Amprobe BAT-250 Battery Tester is an upgraded model which works well and fits great in your hand. Also, you can use it to test a wide range of batteries with ease. Whether you need to test AAA batteries, D batteries or any other batteries in between, this device won’t disappoint. The tester also has a wide display that’s easy to read and comes with clear, color-coded indicators. This display allows you to check your battery’s status without having to deal with confusing readings. Also, you can test various batteries at one time effortlessly thanks to the battery holder that’s spring-loaded. The compact size of this tester allows you to hold it in one hand while you’re testing. Also, the size makes it highly portable so you can bring it along with you whenever you travel. The Amprobe BAT-250 Battery Tester doesn’t need batteries to work which means that you won’t have to make replacements every now and then. The battery tester’s display is color-coded making it easier to read. You can use it to test different types of batteries both rechargeable or standard. The tester doesn’t need batteries for it to work. Some customers complain about inaccurate readings. Why we like it: This convenient model plugs into your vehicle’s power receptacle or cigarette light to monitor the battery and the voltage of the charging system. The INNOVA 3721 Battery and Charging System Monitor’s design makes it ideal for negative ground systems with 12-volts. It has an LCD display which shows you the measured voltage with a bar graph that indicates the charge level of the battery. The INNOVA 3721 Battery and Charging System Monitor allows you to make quick and accurate readings. It has an LCD display which shows the condition of your charging system and your battery right away. It’s a high-performance device which keeps the engine computer of your vehicle protected along with the 12-volt accessories from any surges which may cause damage when you’re recharging or jump starting. You can plug this tester into the power receptacle or cigarette lighter of your vehicle and use it to check the voltage of the charging system and battery. Aside from showing you the measured voltage, the LCD screen also shows a bar graph which indicates the charge of your battery. The INNOVA 3721 Battery and Charging System Monitor is one of the highest-rated products on the market now. It’s easy to use and would also provide you with quick and accurate results. It’s designed for negative ground systems with 12-volts and even features an LCD display with an indicator bar graph. This model also comes with color-coded LEDs for you to quickly identify the battery’s status. Despite its superior performance, this model comes at a very reasonable price. It performs well without requiring much effort from the user. The INNOVA 3721 Battery and Charging System Monitor offers superior accuracy, especially since it shows four digits in the readout while similar models only show three digits. It’s designed for 12-volt systems with a negative ground. It has an LCD display which shows the measured voltage and the charge level of the battery. The LED’s are color-coded for quick identification of the battery’s status. The head of the battery tester pivots for easy adjustment of the angle and viewing. It might break down after a few months of use. Why we like it: You can use this car battery tester to test both 6 and 12-volt batteries which makes it ideal for different kinds of vehicles. Use the Schumacher BT-100 100 Amp Battery Load Tester to test the condition and load of the battery along with the starter motor draw. You can even use it for a complete diagnosis of your charging system. It has a rocker switch mounted on the top for easy operation. The Schumacher BT-100 100 Amp Battery Load Tester is the best car battery tester to use every day on both 6-volt and 12-volt batteries. You can use it to test more than your battery’s level of charging. Its meter is shock-resistant and comes protected by a sturdy case made of steel with a durable finish of baked enamel. This is a fairly traditional tester which you can use on different types of batteries. The Schumacher BT-100 100 Amp Battery Load Tester has different functions from testing your batteries condition, its load, and more. To improve the safety of the device, it has a carrying handle that’s covered with insulated rubber. This battery tester has a traditional design which makes it easy to use. You can plug it into the cigarette lighter of your vehicle. Also, it comes with battery clamps with a super-grip feature and a rocker switch that’s mounted on the top. All these features of the Schumacher BT-100 100 Amp Battery Load Tester make checking your car’s battery a breeze. There’s nothing fancy or complex about this battery tester. This makes it the perfect choice for beginners or for those who want a basic but highly-effective model. It performs a 100-Amp load test on batteries with 12-volts which is a much better way of testing the health of a battery compared to just testing the battery’s voltage. Has good compatibility with different types of vehicular batteries. Tests the battery’s condition, the load, the diagnosis of the charging system, and more. The rocker switch is top-mounted to allow for easier operation. Comes with heavy-duty battery clamps with a super-grip feature. The rubber handle may heat up while in use. Why we like it: This tester has an operating range starting from 1.5V up to 30V, and you can use it to test both 6V and 12V batteries. The SOLAR BA327 20-2000 CCA Electronic Battery Tester with Printer has good compatibility with several types of batteries. It even has a printer built into the device so you can print service documentation on thermal paper. The SOLAR BA327 20-2000 CCA Electronic Battery Tester with Printer provides a complete solution for your testing needs. You can use it for 6V and 12V batteries and for 12V and 24V charging systems. It comes with a built-in printer which provides convenience, especially if you need to take down the results of the tests. This model features intuitive and easy operation with a fast and accurate assessment of the condition of your battery’s condition. You can also use it to test the starting and charging performance of your system. This tester will walk you through the sequence of testing while giving you significant information and guides for each of the steps in the testing process. This model features large buttons to make it easier for you to work with it, even while you’re wearing gloves. The SOLAR BA327 20-2000 CCA Electronic Battery Tester with Printer even recalls the last values you’ve acquired in the previous test. Therefore, if you use it to test similar batteries, repetitive testing becomes a quicker task. One of the handy features of this tester is the integrated printer. This provides you with easy and quick service documentation. Printing on this small device is very quick and clear. You would have the whole printout in a matter of seconds. 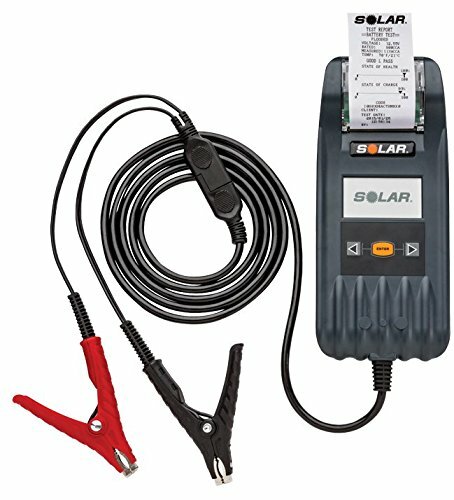 The SOLAR BA327 20-2000 CCA Electronic Battery Tester with Printer also includes cable leads which are 10-feet in length to help with different testing tasks. You can use it for battery and system testing. Compatible with different types of batteries on different vehicles. Comes with a printer built into the device for documentation purposes. Includes cable leads which are 10-inches in length. It’s one of the more expensive products on the market. 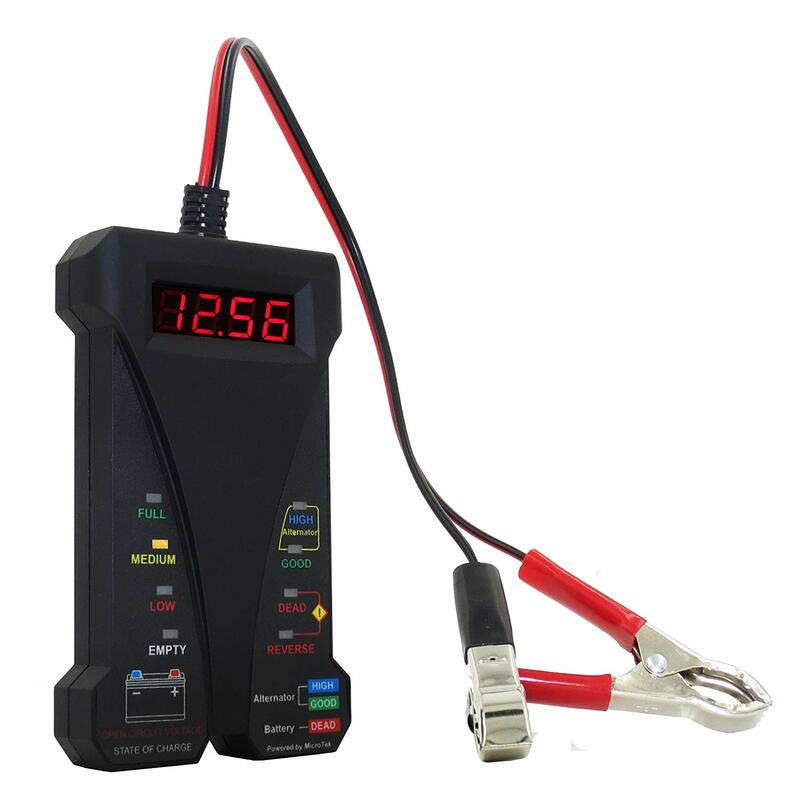 Why we like it: You can use this car battery tester for testing 12V batteries from 100 up to 1,200 CCA, and it has an operating range starting with 7V up to 15V. Use it to test different types of batteries, even those which come with a Starting Rating. 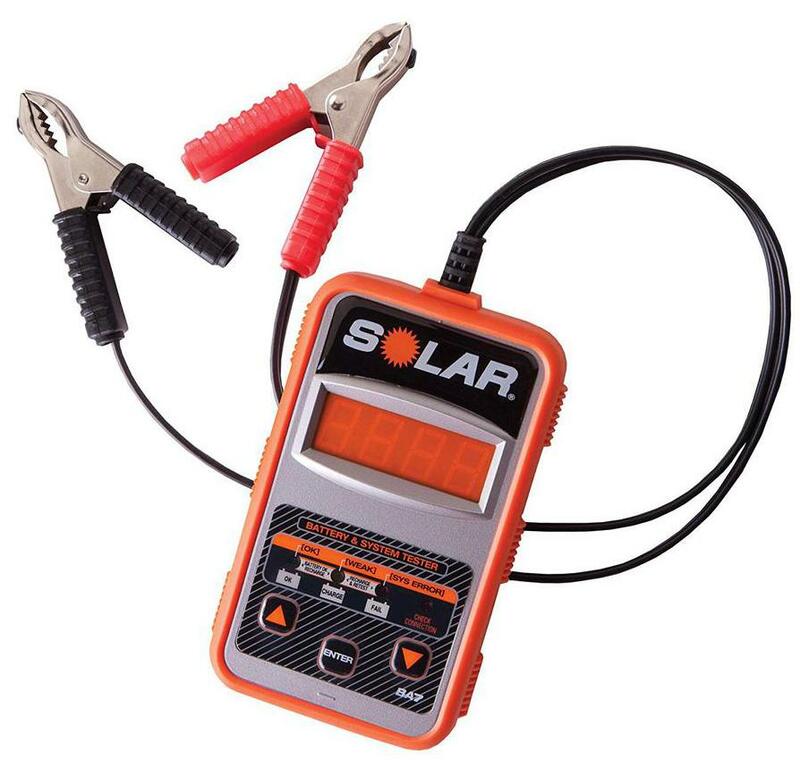 The SOLAR BA7 100-1200 CCA Electronic Battery Tester has a LED indication of the status of the system and the battery. It also presents the reading derived from the tested battery. This model makes it on our list for the best car battery testers because of its superior efficiency. It’s a 12V system and battery tester which has an operating range up to 15-volts. The SOLAR BA7 100-1200 CCA Electronic Battery Tester also has the ability to test batteries rated up to 1,200 CCA. This model also has a convenient feature for testing a system’s starting and charging. It also provides a fast assessment providing you with a numerical and a LED result. With this tester, you can tests batteries and systems with ease while acquiring all of the results you need on the 4-digit display. One of the best features of this tester is its good compatibility. With it, you can test a wide range of batteries, including traditional car batteries made with lead-acid, deep-cycle batteries, AGM batteries, and more. The SOLAR BA7 100-1200 CCA Electronic Battery Tester has an operating range between 7V-15V, and you can perform testing if batteries with ratings up to 1,200 CCA. Another great feature of the SOLAR BA7 100-1200 CCA Electronic Battery Tester is its compact and portable design. The small size makes it easier to bring the device along wherever you go. It’s also user-friendly as it offers guidance all throughout the testing process. It also offers over-voltage protection and reverse polarity to keep your equipment safe. Compatible with different types of batteries. It shows the derived reading for the battery you’re testing. Very easy to use as you would have guidance while you’re testing. It has a bright LED display with 4 digits making it ideal even for low-light environments. It might not last for more than a few months. 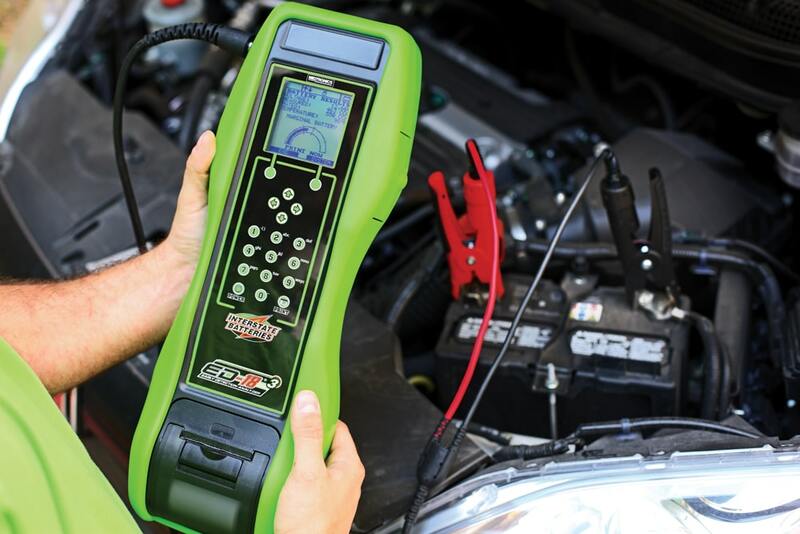 Why we like it: This tester comes controlled by a microprocessor to provide you with a quick and accurate reading to check if your car’s battery needs a replacement or a jump. Simple as the MOTOPOWER MP0514A 12V Digital Battery Tester may seem, it comes with safety features such as the over-voltage protection and the reverse hookup. Also, it has a lighted display making it easy to read. 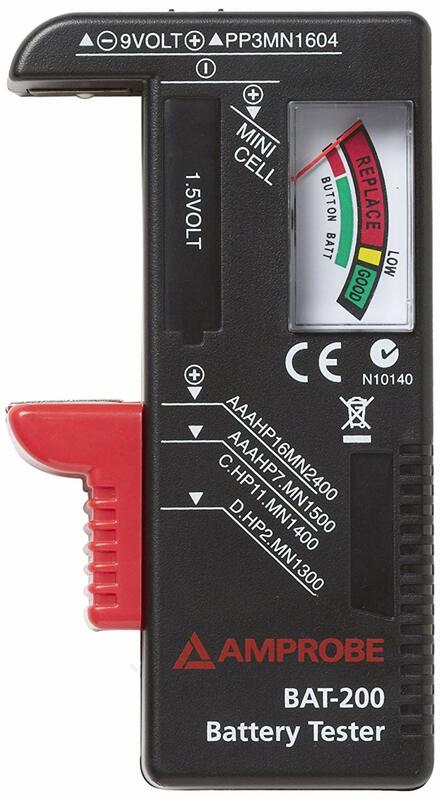 The MOTOPOWER MP0514A 12V Digital Battery Tester is one of the most versatile models available on the market now. You can use it to rest batteries from 4V up to 20V. It has a digital display with a red light to provide you with an easy-to-read and precise reading when you’re testing batteries. Many consider this as a universal battery tester for cars because it works with different types of batteries. Also, it includes connector leads with an alligator style and clear marks making it easier for you to see their polarity. It’s simple to use, but it performs with superior efficiency. One of the best features of the MOTOPOWER MP0514A 12V Digital Battery Tester is its ergonomic design. Because of its shape, you won’t feel fatigue even though you hold on to it for long periods of time. It has an indicator which shows you whether your battery works well and also, to check if your alternator is still functioning. Also, the MOTOPOWER MP0514A 12V Digital Battery Tester comes with great features such as the DC testing range, the accurate digital display, and the LED light indicators. It even has safety features such as protections for overload, short circuits, and reverse polarity. Its housing has black-colored rubber paint, and it includes a pair of alligator clamps. It’s simple and safe to use thanks to the over-voltage protection and reverse-hookup features. Its digital display has a backlight so you can read the results easily and accurately. The LEDs are color-coded to indicate alternator or battery status. Includes alligator clamps and a body with black rubber paint. Some issues on the quality of the tester. Why we like it: The FOXWELL Battery Tester will provide you with an accurate reading when testing your car’s batteries. It allows you to check the health status of the batteries and calculate the aging status and cold-cranking capability of the batteries too. Using this tester will give you quick results to make sure that everything in your vehicle works well. 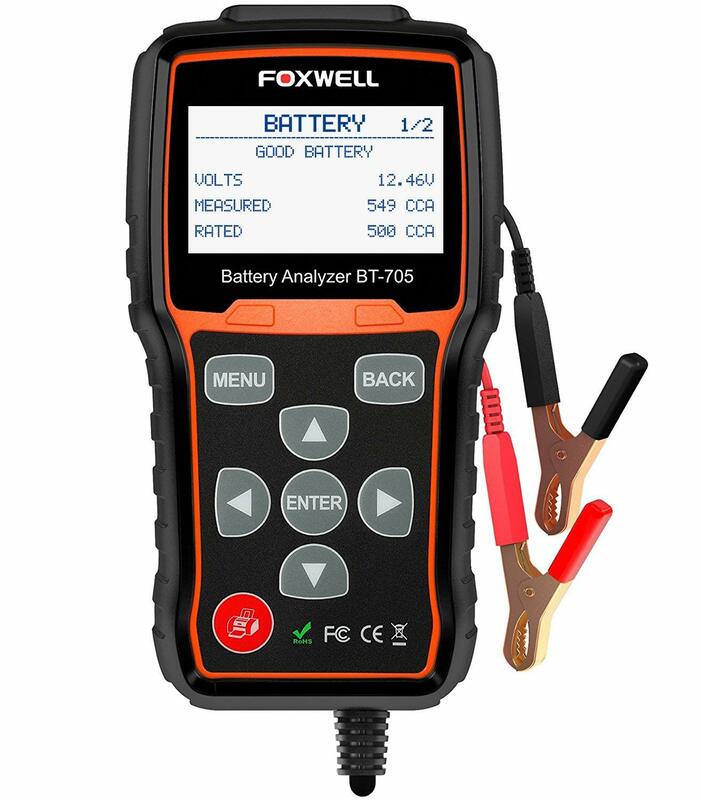 Some excellent features of the FOXWELL Battery Tester are its accuracy and its ergonomic design. This makes the device perfect for private car owners and for those who own mechanic shops. 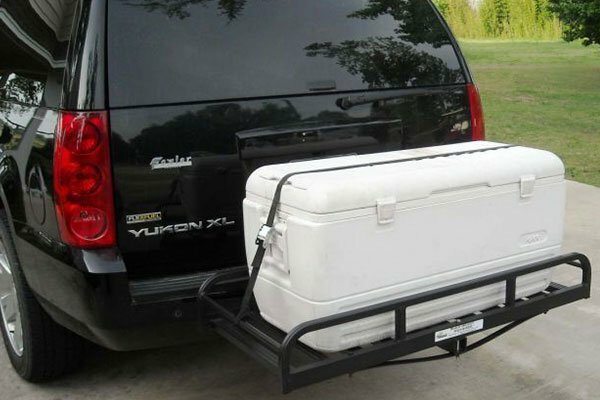 It comes with a cable that’s more than 7-feet in length so you can check your car’s battery even from inside the vehicle. Because of the design and the size of this tester, you can conveniently carry it around with you wherever you go. It provides you with precise results about the health of your battery. It even has a clip and wire made of a premium quality material to maintain the stability of the connection while you’re testing. The sturdy materials of this tester make it a heavy-duty and long-lasting device. 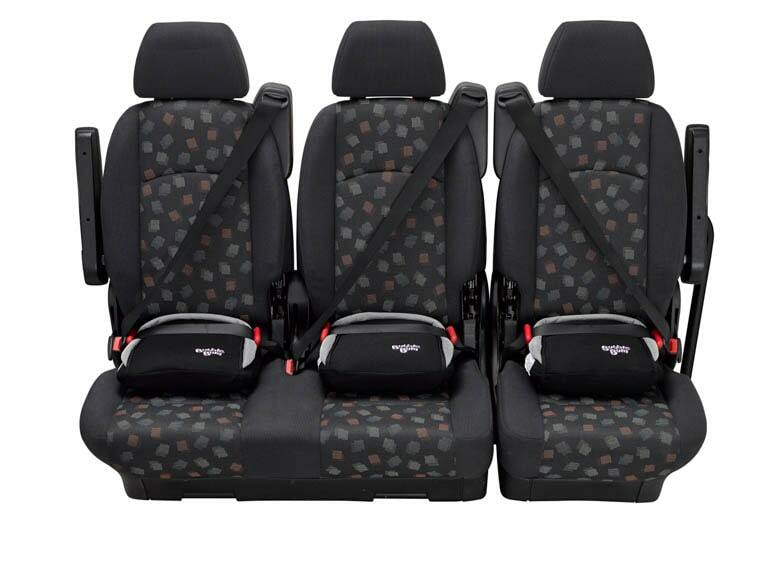 Its overall construction makes it resistant to damage, a perfect choice for mechanics and technicians. It fits in the palm of your hand it easy to use. It also offers different languages on the menu such as English, Dutch, Italian, and more. Some of the best tools on the market are those which come with handy extras. For one, it has a test cable that’s more than 7-feet in length and a pair of advanced clamps. These clamps are of all-metal spray gold to provide spark-proof and short circuit protection. The FOXWELL Battery Tester also comes with a durable packaging case to prevent any damage to the device while in storage. Metal frame made of a strong material which allows for superior durability. The full-grip handle and tension knob provide comfort. Allows for a cutting depth of 4 inches and above. You can perform flush cuts with the hacksaw because of the adjustable angle of the blade. Some issues with the inconsistency of the results. Why we like it: This tester provides a much wider range for testing and more accurate results compared to other models. 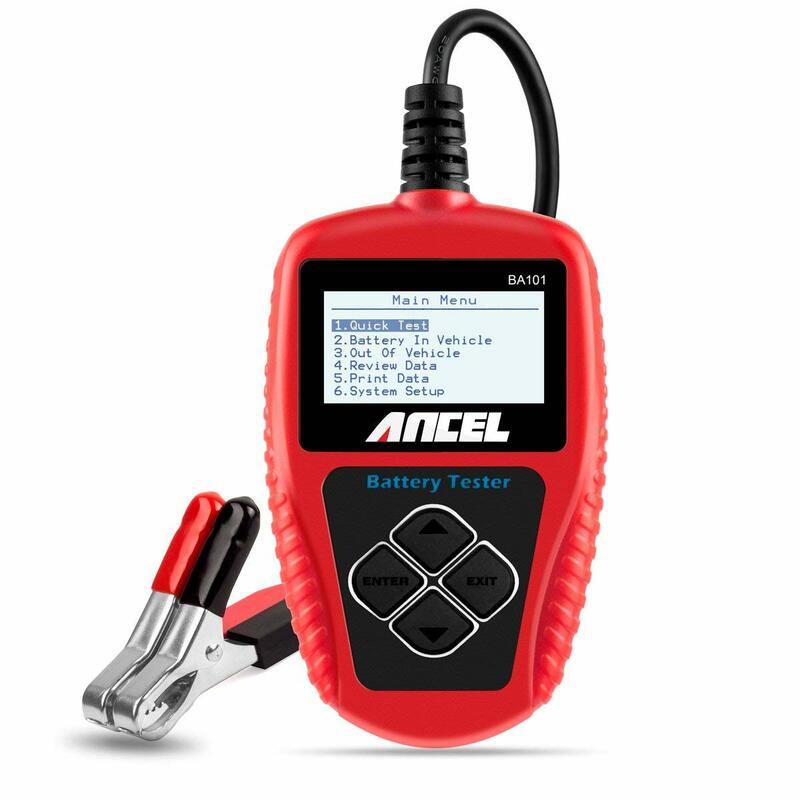 You can use the ANCEL BA101 Automotive Load Battery Tester to test batteries along with the cranking condition of the starter, the charging of the alternator, and more. It even comes with a cable that’s 3-feet in length made of insulator that’s very flexible and thick. What sets this tester apart is that it makes use of advanced technology for conductance testing, therefore, providing you with authoritative and accurate test results. Use it to analyze data quickly and have the results in a matter of seconds. It’s easy to use, and it can accurately measure any problems with your battery. The ANCEL BA101 Automotive Load Battery Tester can test CCA and AH values along with other testing standards such as JIS, IEC, BCI, GB, and others. Just input the value or the standard you need in the device’s “Quick Test” menu. With this model, you don’t need to worry about complex procedures. The ANCEL BA101 Automotive Load Battery Tester has a compact design which enhances its portability. It works quickly and provides you with accurate results regarding the battery of your vehicle. It’s so user-friendly that beginners won’t have any trouble using it. This model will give you all the information you need about your car’s battery from the battery life, the OHM resistance, and the voltage power. Despite its small design, this car battery tester is very easy to use. With the ANCEL BA101 Automotive Load Battery Tester, you can acquire indications and results regarding your vehicle’s battery in a short amount of time. Use it to test the health of 12V batteries with precision, speed, and ease. It’s a multi-functional device which you can use for battery testing and more. Includes a cable that’s 3-feet in length and made of a thick and flexible insulator. Comes with Enter and Exit buttons which allow for easier navigation. Comes with a warranty that’s good for 2 years. It’s not suitable for batteries of motorcycles. Why we like it: This is an ergonomically-designed device which provides you with reliable and accurate results in a matter of seconds. 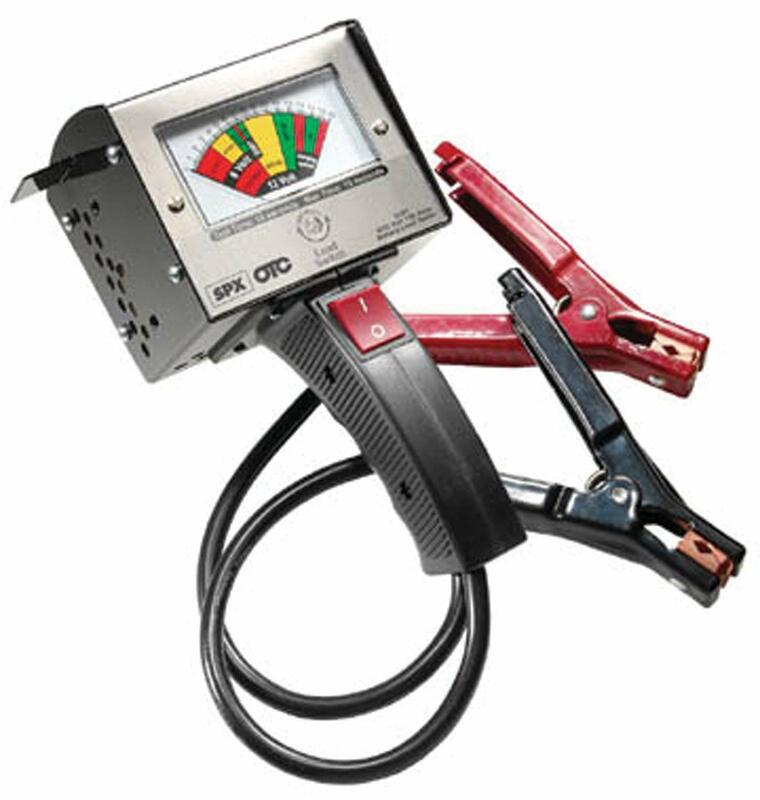 The OTC 3181 130 Amp Heavy-Duty Battery Load Tester comes with clamps which have a unique design allowing for positive grips on the side and top-post batteries. It even comes with an extra-large display to allow for easier reading after testing. The manufacturers of this model used an industry-leading load of 130-Amps. It has an ergonomic design and a heavy-duty production. This tester will provide you with reliable and accurate results each time you use it. The OTC 3181 130 Amp Heavy-Duty Battery Load Tester even comes with special clamps which work on 6-volt and 12-volt batteries. The materials of the OTC 3181 130 Amp Heavy-Duty Battery Load Tester make it a sturdy, heavy-duty device. In terms of construction, it’s built like a tank! It’s made of high-quality materials which ensure longevity and efficiency whether it’s used by amateurs or professional mechanics. One the of best features of the OTC 3181 130 Amp Heavy-Duty Battery Load Tester is its versatility. You can use it on virtually any type of vehicular batteries except for those on trucks. 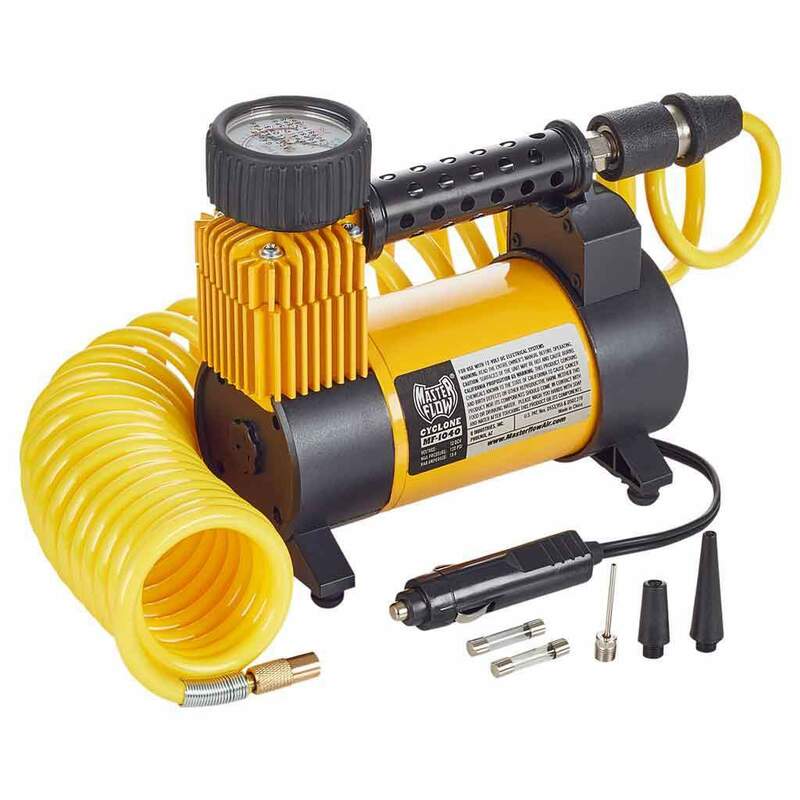 It even includes alligator-type connector leads with high amperage and a thick wire for enhanced durability. This device has an analog display that’s easy to read and is color-coded. These colors will indicate whether your battery is still in good condition or if it needs replacement. You can even use this car battery tester to check the functionality of your car’s alternator. Works on different types of batteries, both 6V and 12V. The display is extra-large in size and has a zero adjust. Has brackets on the back so you can store the tool on the wall. Has tabs on the side for on-tool storage of the clamp. It may heat up while in operation. Keeping your car battery charged and maintained is very important. As you just discovered, there are some great car battery testers available on the market. These are the best car battery testers for you to choose from. But before making a choice, there are some important factors you need to consider. The question now is what important factors should you consider when buying a car battery tester? Let’s explore. Since the main purpose of the device is to test batteries, think about what type of battery tester you need. This will depend on what you need and if you’re planning to perform any repairs on your vehicles. This type of tester usually comes with a large resistor. When you engage the resistor, the tester will take on an electrical load as the car’s starter motor. Therefore, it will be able to help you determine if your car’s battery is functioning properly. But before using this type of tester, you need to make sure that your battery is fully charged. This is the simplest type of tester available, but it’s very handy. Using it would allow you to see your battery’s current voltage. After testing, you can determine whether or not your battery needs charging or if you already need to replace it. The display is where you see the results of the test. It should be big enough so you won’t have to squint just to get the reading. You may also opt for testers which have backlit display screens so that you can still see the reading even in conditions with low lighting or visibility. Most car battery testers come with the connector leads. These leads should be big enough so that they can fit different types of battery connectors. Also, if you plan to use the tester for longer periods of time, choose one which has an ergonomically designed handle for the connector lead with a soft material covering it. Finally, you should also consider the back portion of the car battery tester. Some models come with an anti-slip feature which is very handy. There are times when you need to place the tester in a position where it might slip and fall to the floor. But if the device has an anti-slip feature, this won’t happen. Look for this feature to keep your tester safe no matter how awkwardly you position the device while testing. The anti-slip feature would be a soft, rubberized material which will grip your tester safely in position. Knowing how to use a car battery tester is as important as knowing how your car battery functions. Apart from finding the best car battery tester, you should also know how to use the device properly. That way, your newly purchased device won’t break down after just a couple of uses. The connector leads of battery tester have a positive and negative charge. These connectors will have color-coded wires to indicate their polarities. Make sure these connectors are always clean to prevent rusting or corrosion. Before you start, attach the connectors to your car battery making sure that you match the appropriate polarities. After doing this step, you can switch your battery tester on. After turning the device on, the tester should start doing its work and after a short while, provide you with the results you’re looking for. If your battery is in good condition, the tester will indicate this. It will also help you determine if you already need to charge or replace the battery of your vehicle. Finally, testing the battery of your car isn’t the only thing to do. You should also check the battery’s alternator to see if it’s properly charging the battery. At this point, you would have to switch on the engine of your car. Don’t disconnect the tester from your car battery when you start the engine so that it will show you whether the alternator works or not. The tester should show you a voltage between 13.7-14.7 as this is the normal voltage that an alternator sends to a battery while charging. If you see a lower value, then your alternator might have a problem. When you look at a car battery tester, the first thing that would come into your mind is that it’s a very simple device. However, there’s still a lot to consider when choosing one. From the type of battery to the extra features, we’ve provided you with a lot of information to make choosing the right model easier for you. We’ve reviewed some of the best car battery testers available on the market now. Selecting any of the products on our list would ensure a superior purchase. Once you’ve made your choice, the next thing to do is learn how to use the tester properly so it can provide you with the accurate results you need.